Making ice cream is a rite of passage into the long, hot days of summer. It's surprisingly easy to make your own ice cream, but many people don't realize just how simple it is. Really, if you learn how to make a basic custard base, your imagination is the only limit to the flavors you can come up with. We like a mixture of sweet and savory/toasted flavors. An easy way to get these two flavors together is to grill the fruit we want to use and then make up our custard. As the fruit and custard base cools together, we get the rest of the equipment together and start the process. A hand crank ice cream maker is a family tradition, but I am on the lookout for a great deal on a compressor model. How fun would it be to have an ice cream maker that mixes and freezes while we are having our meal? It's on the wish list for the summer of 2016! This is one time when you don't want to skimp on quality ingredients either. Just serve smaller, more satisfying portions of this dense, creamy treat. Your family is going to love it. 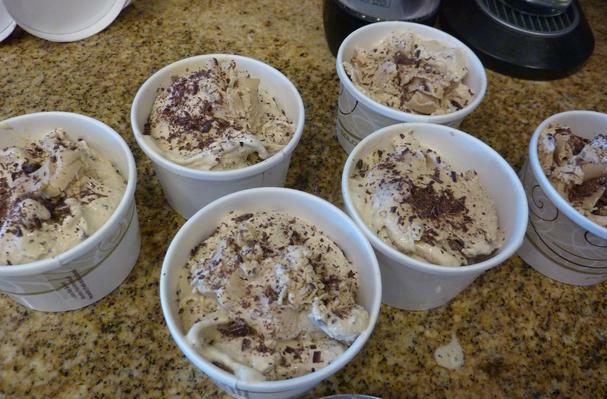 Meanwhile, try this delightful coffee flavored ice cream with bittersweet chocolate. It's super easy to make and so rich, you will want to make it every time you have a barbeque. 1 Prep your ice cream maker according to the manufacturer’s directions. 2 Heat the half & half until warm- not hot. 4 And about 1/2 of the warm half and half. 5 Stir to combine well and add the mixture back to the saucepan. Whisk briskly while combining. 6 Cook over medium heat until the mixture coats the back of a silicone spatula (about 10-12 minutes). 7 Place the pan with the custard in an ice bath to cool, stirring occasionally, until it reaches room temperature. 8 Add the cream, coffee and vanilla, stir well. Pour into another container and chill until cold -several hours-or you are ready pour into the ice cream maker.